So I have read into this a lot and have not found too much on this particular topic. I have had dobs my whole life. Some have have died prematurely and some have lived to around 14 years. They have ranged from a rescue female that was only 65lbs to a male that was 110lbs. I have been around police and other work dogs as well. What it seems to me is that the dogs with the higher work ethic and smaller in size tend to last longer. My favorite doberman out of all of them was a male that my mom owned he was so intense and wanted to work. Up until he was 13-1/2 years he would still run like a greyhound when he was chasing his ball. He had a beautiful stance and pranced around like a show dog most of the time. Unfortunately my mother was against breeding and bitework. The only place that I have found that works show quality dogs, and cares about genetics is Adlercrest. Unfortunately they are almost 3000 miles away and don't have any pups available. If anyone has any suggestions it would be greatly appreciated. Adlercrest is far from the only one. 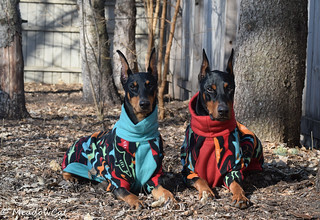 Head over to the United Doberman Club's website. You'll find some breeders who do both. I know SharJet does both. Are you looking to show in the AKC conformation ring, and work a dog in IPO bite sports? You're correct that it's certainly harder to find that, but they do exist. You have to have patience and do research to find what you want. I'll also say that I would certainly not limit myself to a breeder near me for the right puppy from the right breeder...if there's a breeder you love, it's worth a road trip or flying a puppy to you. Neither of my dogs was local to me. One I drove to get, one I had flown in...both worth it.